﻿We had a wonderful experience. My daughter is four and is NOT afraid of going to the dentist at all. She actually gets excited and looks forward to it. The staff makes young ones feel very comfortable and the treasure box is awesome! Children love to be at our office as well! That's because we do all we can to make their first dental experience a fun one. Yes, you read that correctly, FUN. We start off in the reception room with toys and books and chairs just their size. In the treatment room they get to choose their favorite TV channel or bring in their favorite DVD. They get to "ride" in our special "space chair" and we look in their mouth with a special "miniature spy camera" (intra-oral camera) and examine their teeth with a "tooth counter". Then, we polish their teeth with special toothpaste and give them "tooth vitamins" (fluoride treatment). A special gift is given to our kids on completion of their first visit. We recommend that you bring your child in at age 1 for a well-baby checkup. Ask us about a FREE FUN VISIT for your toddler. Parents love the experience for different reasons. 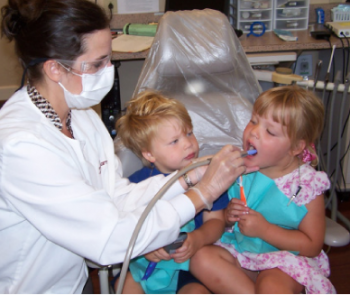 Sure, we make dentistry comfortable and maybe even entertaining for your kids, but parents really appreciate our philosophy of prevention, early detection, and prompt intervention. We hope your kids never know what "root canal" means. Prevention certainly includes brushing, flossing, routine visits and fluoride treatments. Each child (age 15 and under) who comes in for a routine cleaning and leaves without cavities is automatically a member of the No Cavity Kids Club! Members will be entered into a quarterly drawing for an awesome grand prize of their choosing! The winner will have their picture taken and displayed on our "No Cavity Club Hall Of Fame!" With parent permission, the winner will also be featured on our website and social media pages! How fun is that! Sealants are easy for Dr. Melissa to apply, and it takes only a few minutes to seal each tooth. The teeth that will be sealed are cleaned. The sealant is then 'painted' onto the tooth enamel, where it bonds directly to the tooth and hardens. Sometimes a special curing light is used to help the sealant harden. 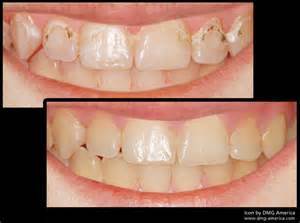 As long as the sealant remains intact, the tooth surface will be protected from decay. Sealants hold up well under the force of normal chewing and usually last several years before a reapplication is needed. During your regular dental visits, Dr. Melissa will check the condition of the sealants and reapply them when necessary. Talk with us to determine if sealants can help protect your child's teeth.Melissa will check the condition of Talk with us to determine if sealants can help protect your child's teeth. Sparkling Colored Filling Is your child nervous about going to the dentist? If so, we can help by making their next visit a lot more fun! Introducing Twinky Star, a modern filling material in 7 sparkling colors that kids love. Getting your child to participate in selecting their favorite color will help reduce their apprehension and nervousness and will make their treatment more enjoyable. Rest assured…Twinky Star is a well-researched, advanced filling material for primary (baby) teeth that is entirely safe. In fact, it offers outstanding properties including the added benefit of releasing fluorides, which have been clinically proven to help reduce cavities. 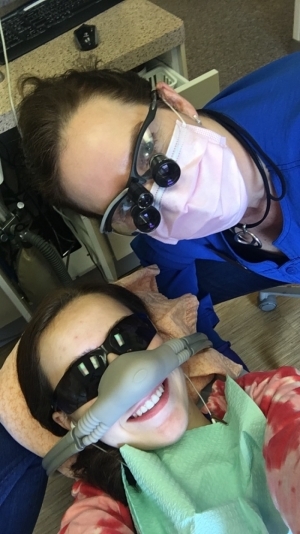 At our office we commonly use Nitrous Oxide/Oxygen sedation (laughing gas) to help relax our patients and help the time seem quicker in the dental chair. Sometimes it is hard for kids to sit still for prolonged periods of time, so we always try our best to keep kid’s appointments quick. When necessary, Nitrous Oxide/Oxygen sedation is a wonderful and very safe way to help kids relax. With laughing gas the kids are awake and can let us know any time they need anything. We tell kids they will feel like an astronaut or angel and may feel like they are floating when using the gas. Kids do not have many restrictions with the use of the gas. We ask that they not eat a large meal before coming to see us for treatment. Any child sedated with laughing gas will be fine to return to school after any local anesthetic has worn off. Do you think the special mask looks like an elephant nose or an astronaut's mask? When it comes to protecting your kid's mouth, a mouth guard is an essential piece of athletic equipment at an early age. In fact, an athlete is 60 times more likely to suffer harm to the teeth when not wearing a mouth guard. 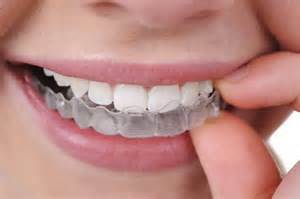 Mouth guards help buffer an impact or blow that otherwise could cause broken teeth, jaw injuries or cuts to the lips, tongue or face. Mouth guards also may reduce the rate and severity of concussions. Mouth guards are most commonly used in contact sports like boxing, football, hockey and lacrosse, but findings show that even in non-contact sports like basketball or skateboarding mouth guards can be helpful. Every year during baseball season we see several accidents. Ready-made or stock mouth guards can be purchased at sporting goods stores but for superior protection we are happy to assist your athlete. At our office we make custom mouth guards or boil-and-bite mouth guards. Please let us know if your child needs a FREE boil-and-bite mouth guard from our office or a custom mouth guard. 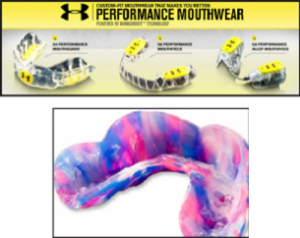 Ask us today about the Under Armour Mouth guards. They just take a few minutes to make and may save you thousands of dollars. At our office we continuously screen children for orthodontics. Most children do not need to start orthodontic treatment before they lose their baby teeth, but occasionally we recommend early treatment to help make room for the permanent teeth or take care of severe crowding issues. 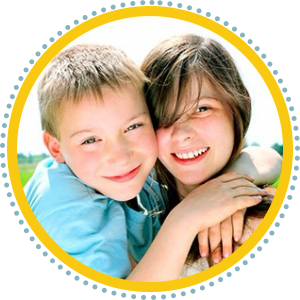 The American Association of Orthodontists recommends children have an evaluation at age 7. We only recommend starting treatment if a child is mature enough to take care of his/her teeth during treatment because it is harder to clean and brush your teeth with braces on. Minor tooth movement can be accomplished here in our office, but usually we refer our patients to the orthodontist of your choice. If you have any questions, please ask us about traditional braces or Invisalign for your child. Dr. Melissa and team strive to keep up with the latest technology. 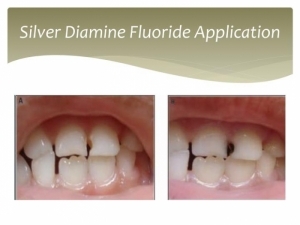 In late 2015 the FDA cleared Silver Diamine Fluoride (SDF) for reducing tooth sensitivity. Clinical trials document arrest and prevention of dental decay with SDF. The off-label use is permissible with U.S. law. We offer SDF to our patients to give you the protection you deserve. *It is an antimicrobial agent that is applied to teeth to kill bacteria and prevent the formation of new biofilm that causes cavities. Dr. Melissa and team believe less is more when it comes to dental treatment. Icon is one way we help strengthen teeth and prevent larger cavities. 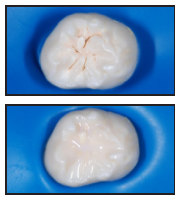 Here is one way Icon can be used to strengthen enamel. No Drilling! WOW! White Spots: Icon is effective on cariogenic white spots, especially immediately after removing braces. Even brown spots, which have developed over a longer period of time, can be treated aesthetically, provided the surface does not have a hole. Please call us at 453-4369 to learn more about this amazing technology. Rule #1: Brush your teeth at least two times a day, especially at night. Rule #3: When you’re thirsty and it’s not meal-time, ask for water. Rule #4: Eat healthy snacks, such as yummy cheese and fruit. Rule #5: Avoid chewy candies, juice and soft drinks as often as you can and if you eat or drink any of these, be sure to brush right after. Follow these rules and not only will you have great teeth, you will be a star member of the NO CAVITY KIDS CLUB and you can win great prizes! 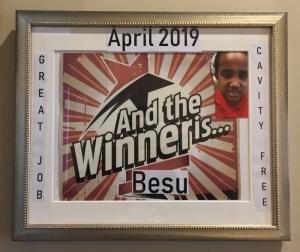 Congratulations on your child being cavity free! Dr's. Jarrell and Oliveira are committed to your child’s oral health and we want to make his or her dentist visits as informative and fun as possible. We have developed our NO CAVITY KIDS CLUB to help motivate parents and kids to take better care of their teeth and live healthier lives. 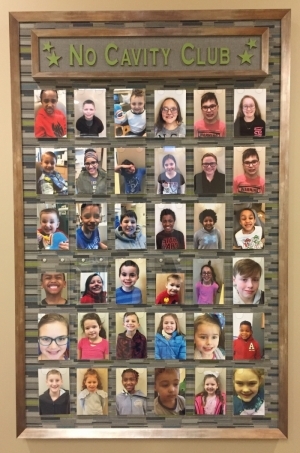 A benefit of being cavity free is that your child will earn a special listing on the NO CAVITY KIDS CLUB section of our website, and will also have their picture on our NO CAVITY HALL OF FAME in the office. Your child is special for keeping cavity free and will also be entered into a quarterly drawing for the chance to win a prize. If for any reason you do not want your child’s photo listed, we will promptly remove it. Join the No Cavity Club Today! We recognize that it can be difficult for kids to realize the importance of good dental care, which is why we are proud to make brushing a fun and rewarding experience. If you are looking for a dentist who knows how to motivate your child to take good care of his or her teeth, join our No Cavity Club by calling 765-453-4369, and discover how rewarding fighting off cavities can be! For your convenience, we also offer extended hours as needed.